The Financial Times (FT) is an international business newspaper. It is a morning daily newspaper published in London and printed in 24 cities around the world. Its primary rival is New York City-based Wall Street Journal. The FT has a global print circulation of 381,658. Along with FT.com, it has an average daily readership of 2.1 million people worldwide (PwC audited figures, November 2010). FT.com has 3.4 million registered users and 224,000 digital subscribers, as well as 605,402 paying users (2 October 2010 to 4 January 2011). FT Chinese has more than 1.5 million registered users. Founded in 1888 by James Sheridan and Horatio Bottomley, the Financial Times competed with four other finance-oriented newspapers, in 1945 absorbing the last, the Financial News (founded in 1884). The FT specialises in UK and international business and financial news. 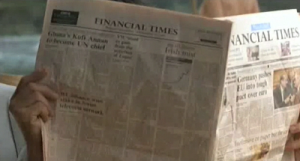 Printed as abroadsheet on light salmon paper, the FT is the only paper in the UK providing full daily reports on the London Stock Exchange and world markets. The back page of the issue he is reading has the headline “Ghana’s Kofi Annan to become UN chief”; this would seem to indicate that the current day is probably December 18, 1996 since Annan was confirmed as UN Secretary-General on December 17 (he assumed the office on January 1, 1997). Mr. Bowman seen reading the paper on Cathy’s Beach, the day his daughter was bitten. Visit the Financial Times website here.